What’s in the crystal ball for the 2018 governor’s race? The view is still cloudy but vague images can be discerned in the glass. One looks strikingly like Gov. Bill Walker, and we can see Lt. Gov. Byron Mallott right behind him. Other images are fleeting — former state Sen. Charlie Huggins, current Sen. Mike Dunleavy of Wasilla, former House Speaker and current Rep. Mike Chenault, former U.S. Sen. and Anchorage Mayor Mark Begich and Scott Hawkins. All but Begich, the Democrat that lost to current U.S. Sen. Dan Sullivan in 2014 who hasn’t yet made any intentions known, are declared Republican candidates for governor. We can make out someone else, barely. Is it John Binkley? It’s political season in Alaska again. Alaskans’ favorite political parlor game for the rest of the year will be who’s up and in and who’s down and out. General elections occur every two years in Alaska on the even year, and 2018 is it. This is also the fourth year for Walker and Mallott, the incumbents in the top two positions in the state executive branch, who are running for reelection. Voters will also elect or reelect legislators, too. Every incumbent in the 40-member state House will be up, as well as half of the 20-member state Senate. House members serve two-year terms and senators serve four-year terms with 10 of them, or half, standing for reelection every two years. Meanwhile, who’s up so far in the big prize: the governor’s race? It’s still early. August, the primary election, and November, the general election, are still far in the future in political time. A lot can, and will, happen between now and then. Both Walker and Mallott have the power of the incumbency, which brings pubic exposure and a huge advantage. But over four years an incumbent picks up negative baggage, and for Walker it is his veto two years ago of half of the money for the annual Permanent Fund Dividend. Former state Rep. Harry Crawford, an Anchorage Democrat, thinks the trimming of the PFD, which the Legislature did itself last year, will hobble Walker. For Alaskans of modest incomes it was a blow in a recession year, Crawford said. “I know Democrats who put Walker-for-Governor signs in their yards last election, but they say they won’t be do it again,” he said. Others, like former House Speaker John Harris, a Republican, say the PFD cut will hurt Walker a bit, but will get lost in the wash by the time the election rolls around. What could soften the sting of the PFD cut is Walker’s decision to expand Medicaid under the federal Affordable Care Act, which helps Alaskans of moderate income get health care. Among rural Alaskans, where the PFD is important to family incomes, the push by Walker and Mallott to give greater recognition to Tribes has been very popular. Still, there are challengers chipping away at Walker and Mallott. 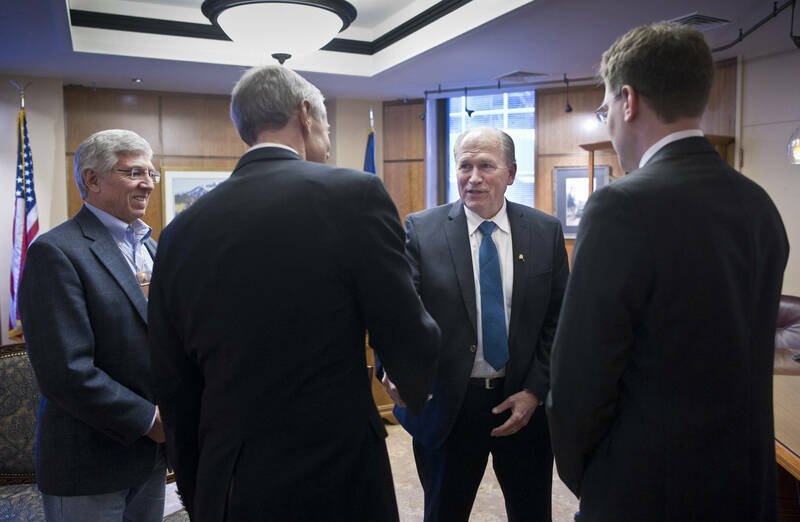 Among Republicans, Walker’s decision in 2014 to run as an independent (he previously ran as a Republican) and to team up with Mallott, a Democrat, to forge an independent ticket backed by union clout, still stings. That initiative led to a razor-thin victory over former Gov. Sean Parnell, the Republican, who was widely expected to win reelection. Parnell’s narrow defeat led to four years of bad relations with Republicans in the Legislature, which hurt Walker’s major legislative agenda items: a state-led gas pipeline and reform of the state’s finances keyed by using Permanent Fund earnings. Opponents who have lined up against Walker will use all that to stoke up fires against the governor. On the Republican side, Dunleavy and Huggins, both from the Matanuska-Susitna Valley, are trying to corner the conservative vote. Dunleavy has loudly championed an uncut PFD, which would continue to rise under the existing payout formula in statute, and also champions budget cuts as the state’s main solution to its fiscal problems. Huggins isn’t yet as vocal on these issues but he has solid conservative credentials after years in the state Senate. This pair will face off in the Republican primary but there are reports the two have a pact that one may withdraw to support the other later this spring if one of the two gains strength among voters (polls show the two are largely unknown). Another name in the Republican race is Scott Hawkins, an Anchorage businessman, who is also a conservative. While Hawkins isn’t widely known either, a new face in the race can become an advantage and lack of name recognition can be overcome if a candidate can raise enough money for advertising. A name that keeps circulating in the Republican race is John Binkley, a businessman and former state senator whose greatest advantage is name recognition and a reputation as a moderate who could offer Republican voters in the primary an alternate to conservatives Dunleavy, Huggins or Hawkins. However, reports are that Binkley is reluctant to enter the race, at least so far. Four of his children purchased the state’s largest daily newspaper this past fall, and have since returned the Alaska Dispatch News to its original name of the Anchorage Daily News. On the Democratic side, Begich is still being talked about, although he is also said to be reluctant about the race after he considered it earlier. If Begich were to enter the race on the Democrat side, he would drain support from Walker and Mallott, particularly among labor groups and traditional Democrats. This would make for an extremely unpredictable three-way race in the general election between a strong Democrat, the independent Walker, and a conservative or moderate Republican. If Begich does not enter the race, it would leave Walker as independent and Mallott pitching to Democrats and a rural voters. Some poll results, which are confidential, show Walker’s popularity down and faring poorly in a three-way race, with a Republican candidate, mainly Dunleavy, showing stronger against an independent (Walker) and a Democrat. In a two-way race, with no Democrat and Walker as independent running only against a Republican, the Republican still looks to win, according to the poll conclusions, which were described to the Journal of Commerce. However, other polls may show different results, and a lot can happen between now and August and November. Walker’s gas pipeline deal with China, although it is not binding, has attracted a lot of attention and the governor will cite it as a key accomplishment. However, the final agreement with major Chinese companies is not due to be concluded until next December, which will come after the November general election. That means Walker can campaign on the promise of the deal. Whether it successfully comes together at the end of 2018 will have no bearing on whether the governor will be reelected or not. Continued debate on the state’s financial situation will color the races, of course. Walker is proposing an employment, or wage, tax on citizens and basically status quo on the budget, while Republicans in the Legislature will oppose the tax and favor more budget cuts. All sides in the Legislature, however, favor a plan to make use of some earnings of the Permanent Fund and to “cap” the PFD near its historic average of $1,100 to $1,200. However, if Dunleavy stays in the race and pushes preservation of the dividend’s current formula, or even to put it into the Constitution (an idea some Democrats also favor) it could set the tone of the 2018 debates in Juneau and legislators’ own campaigns later in the year. As Republicans try to take back the Governor’s Mansion, they’ll also be trying to take back the House that currently has 21 members of their party but is led by a coalition that is dominated by Democrats. After the 2016 elections, three Republicans House members – Reps. Gabriel LeDoux of Anchorage, Louise Stutes of Kodiak, and Paul Seaton of Homer — crossed party lines to join the Democrats in forming the leadership for the House. The Republican party has mounted an effort to oust the three mavericks either from the party primary or ultimately at the polls, but few believe Seaton can be defeated in Homer or Stutes in Kodiak because outside influence, such as from a political party, is typically resented in a small community. LeDoux, from Government Hill in Anchorage, may be more vulnerable, but it’s too early to predict any outcome. The House Majority Coalition’s control of the House is by a narrow margin, however, and the loss of one Democrat plus one of the three Republicans would make for a 20-20 split. Republican-Democrat coalition organizations have happened in both the House and Senate several times in the past, typically with rural Democrats caucusing with Republican majorities. Efforts by the respective parties to defeat such mavericks have rarely borne fruit, although Democrats were successful in defeating Rep. Ben Nageak of Barrow in 2016 by backing Rep. Dean Westland, D-Kotzebue, who just resigned in the wake of multiple allegations of improper sexual behavior. Westlake’s resignation will bring a new face to Juneau from District 40, but his temporary replacement, who will serve until the next election, will be a Democrat from the district appointed by the governor from three names put up by the Democratic party. For now at least, Westlake’s replacement will preserve the basic numbers holding the coalition together.